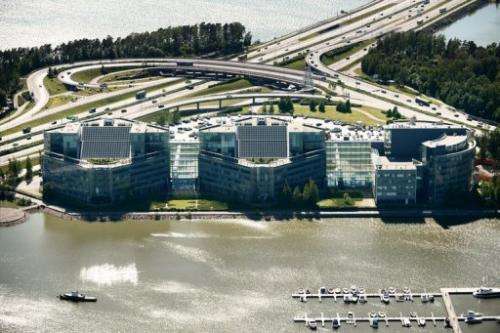 Nokia's headquarters at Espoo, Finland. Rumours that struggling Finnish mobile phone maker Nokia may be up for sale have intensified this week, with analysts seeing three potential buyers who could be even more interested if the company undergoes a restructuring. Rumours that struggling Finnish mobile phone maker Nokia may be up for sale have intensified this week, with analysts seeing three potential buyers who could be even more interested if the company undergoes a restructuring. Independent telecoms analyst Ari Hakkarainen said he was "astonished" that Nokia had not already been snapped up. Once the star performer on the Helsinki stock exchange, Nokia's market value has plunged 30 percent in the past two years, dropping below 11 billion euros ($14.5 billion) at the end of last week. Speculation that the company could be for sale have given the share a small boost, sending its price rising 3.63 percent on Thursday and 1.81 percent on Tuesday. On Wednesday, the Wall Street Journal reported that US technology titan Microsoft was involved in serious talks with Nokia about taking over its mobile phone business, but the negotiations faltered. And on Tuesday, Richard Yu, head of consumer business at Chinese rival Huawei, said in an interview with the Financial Times that his company was "open" to talks with Nokia. Analysts suggest Chinese PC maker Lenovo could also be interested. Speculation about a takeover of Nokia has intensified since April, when a contract committing Nokia and Siemens to their joint venture, telecoms equipment maker Nokia Siemens Networks, came to an end. NSN has been a crucial contributor to Nokia's finances at a time when the company has been in trouble: Nokia has reported a net loss in seven of the past eight quarters amid fierce competition from Apple's high-end iPhone and Samsung's Galaxy. "There will probably be a restructuring of NSN ... Once it is separated from NSN, Nokia would be more attractive to a buyer," Inderes analyst Mikael Rautanen said, noting that the value of a leaner Finnish company would come down further. The Nokia Lumia 925 is displayed during a launch in London last month. Once the star performer on the Helsinki stock exchange, Nokia's market value has plunged 30 percent in the past two years, dropping below 11 billion euros ($14.5 billion) at the end of last week. Pohjola analyst Hannu Rauhala, said NSN was "a separate company", while all of Nokia's other activities were "linked to one another." Once NSN is detached from the rest, the mobile phone unit and geo-localisation services could become attractive to a buyer. Microsoft and Nokia already joined forces about two years ago in an alliance aimed at making inroads with handsets powered by Windows Phone software. Nokia will soon move wholly to the Windows platform, since it has now made its last phone on the Symbian operating system, the 808 PureView. "The most logical thing would be for Microsoft to buy Nokia's phone business," said Rautanen, adding that the US company will come under intense pressure to do so from Huawei and Lenovo. A bid by either of the two Chinese companies "would threaten Windows Phone's future, and Microsoft would have to make a bid" for Nokia in turn, Rautanen said. Hakkarainen said however he thought a Chinese buyer would be "more logical", since the "weak" Chinese brands "could, with Nokia, gain a brand that is recognised around the world." Rauhala said Huawei and Lenovo were courting Nokia because they "need the channels into mature markets" and they "have previously tried to grow through acquisitions." 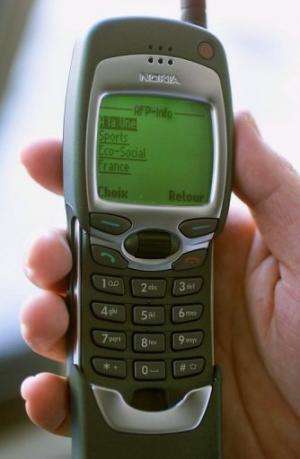 Nokia dominated the mobile phone market for 14 years, until it was overtaken by Samsung in 2012 as the top-selling brand. One of the first Nokia phones with internet access pictured in Paris in February 2011. Nokia has reported a net loss in seven of the past eight quarters amid fierce competition from Apple's high-end iPhone and Samsung's Galaxy. Amid the increasing competition from Apple and Samsung, the Finnish company dramatically changed its strategy in February 2011 when chief executive Stephen Elop warned Nokia was "standing on a burning platform" and needed to immediately shift course. The shake-up involved phasing out the Symbian platform in favour of the Microsoft partnership. 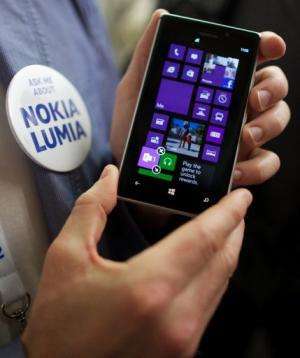 Nokia has bet its future on its new Lumia smartphones, which aim to rival the iPhone and Samsung's Galaxy. The company in April said a 27-percent volume rise to 5.6 million units reflected "increasing momentum" for the flagship handset family, but the company still lags far behinds its rivals. "To give you an idea, Apple sold 40 million phones during the same period," Natixis analyst Eric Beaudet said in April. Analysts seem pessimistic about Nokia's future as an independent manufacturer. "It would be more natural for a single company to make both the phones and the software," said Rautanen, adding it would be "illogical for example for Apple's software and handsets to be made by two different companies."